Carbuncle 2012? Prince Charles’s Poundbury fire station is a right royal mess. 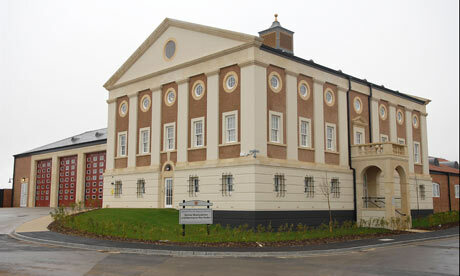 Prince Charles’s new Poundbury fire station. Prince Charles has just completed his first building: a fire station in the twee village of Poundbury, Dorset. A wonderful creation: a dumpy neoclassical Georgian palace with three garage doors attached to it. Now, there’s no doubt that Charles has skim read the odd architecture book, but a little knowledge is a dangerous thing. I think the good firemen of Poundbury should be forced to wear Regency breeches and powdered wigs, and rush to their infernos in a red barouche carrying water in wooden pails. You are currently reading Carbuncle 2012? Prince Charles’s Poundbury fire station is a right royal mess. at nevillerae.